We often use and hear the terms ox and buffalo. But many do not know the difference between the two. Some even think that both the terms ox and buffalo refer to the same animal. You can easily spot the difference between a buffalo and an ox. A buffalo is larger and covered in more hair than an ox. And an ox is the male of the mammal cow. It doesn’t have an udder and is castrated after its adulthood. A buffalo is also a male but not castrated. The buffalo is a bovine animal and used mostly as livestock in Asia, South America, North Africa, and Southern Europe. According to the survey conducted by UNFO, 97% of the world’s buffalo population was in Asia. Buffaloes are useful to mankind in many ways. They are used in the traditional methods of agriculture, as dairy animals, and even for its meat. The dung of the buffalo is a good fertilizer and when dried, it can be used as a fuel in households. These animals are also used to carry heavy loads and are maintained as pack animals. Oxen are also useful to mankind. These are trained as draft animals and used for threshing grains, powering machines which grind grain, and in other irrigational purposes. Sometimes oxen are used to skid logs in the dense forest and work in pairs. When working in pairs, these are used for lighter works like pulling carts. When the oxen are to be used for heavy works, a bigger team is used. The buffaloes can range from 400 to 900 kg in weight and the females are bigger than the males. The horns of the different varieties of buffaloes are different. River buffaloes have long curled horns while swamp buffaloes have gentle curved horns. Oxen are often lighter in shades than the buffaloes. Oxen are friendlier towards humans and are easier to train than the buffaloes. Buffaloes require grass, water, and shade throughout the year and hence they are found very often in areas where there is an annual rainfall of more than 300 mm and the grassy savanna lands. 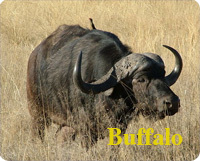 1.Buffaloes are larger and covered with thicker hair all over the body. Oxen are smaller than buffaloes and do not have the thick hair all over the body. 2.Oxen are males and are often castrated. Buffaloes also are males but are not castrated. 3.Oxen are friendlier to human beings and they are easy to train. Buffaloes are not that friendly and easy to train. 4.Oxen often work in pairs while buffaloes work in teams. 5.Oxen are often used to do lighter works like pulling carts and irrigational purposes. Buffaloes are used majorly for the heavy works like agriculture and pulling logs. 6.Oxen have lighter shade coats than the buffaloes. Manisha Kumar. "Difference Between Ox and Buffalo." DifferenceBetween.net. May 19, 2011 < http://www.differencebetween.net/science/nature/difference-between-ox-and-buffalo/ >.